Do You Want to Be Top 1% on LinkedIn? I Can Help You Get There! Linkedin, the social networking site for business owners and job seekers, recently celebrated a milestone: 200 million users world-wide. 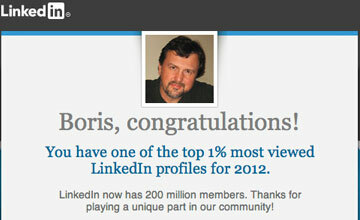 Today I received this email from Linkedin announcing that my profile is in the top 1% most viewed in 2012. 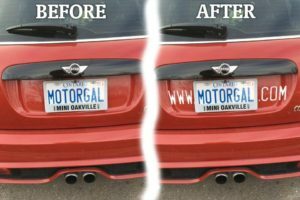 I have been using Linkedin for business for several years, and have found a simple-to-follow formula that I teach to my one-on-one mentoring clients, and also to students who attend my live workshops. One of the ways to succeed in generating new businesses using Linkedin is to create a winning profile page. If you’re an entrepreneur, you likely have several businesses, so list them all as your current positions. One word of advice: when you’re describing a position use relevant keywords you want to be found for. Do some keyword research using this free tool from Google. Once you receive a number of recommendations don’t change the description of a position. This is because you will have to approach all your contacts to re-confirm their recommendation. Once you have your current positions listed approach all your most recent clients and ask them for a recommendation. I can teach you, too, on how to use this social media outlet from lead generation to closing more deals. If you’re on a limited budget, you can start with my self-study audio CD and mp3, Linkedin: Social Networking for Professionals. Next step would be to attend one of my Linkedin to the Max! workshops. Please contact me if you’d like to arrange for one-on-one training sessions with me.